is this result that you've asked? download the sample data from here http://www.2shared.com/document/2Vlm8cWU/sample.html (the sample only has a 20 items, the original one has 21000) and some products are the same from even 8 suppliers. I want to get rid of the duplicate products with the same reference and keep just the one with the smallest price. I hope I explained now correctly. want to get rid of the duplicate products with the same reference and keep just the one with the smallest price. Not at all i hope see you soon! Yeah array formula isn't working fast than the normal formula. If you have a table with great range then it'll took a lot time for calculation. Now i have a look there where you've linked and i thing you have an another choise. 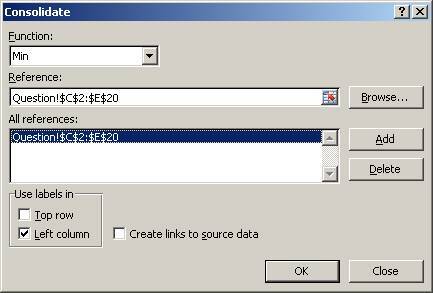 I suggest you to use pivot table to get perfect result good luck! Hi dear Mtanislav really i want to help you. Yes pivot table gives the best report form but there is several steps (but not more). if you want i promise you i'll give you info about how creating pivot table. but now you have an onother way i suggest you to use "Consolidate" from Data/Data tools/Consolidate that is faster and shorter than the other ways. There is no more steps, i hope you'll enjoy from this result. Good luck!!! Good morning Mtanislav what is an error? can you discribe that?